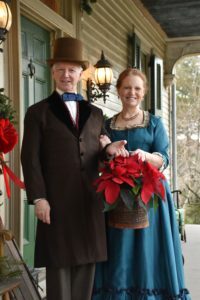 While we love 18th-century songs and dances and the opportunity to craft new shows around period themes–most recently, “The Real Music of Alexander Hamilton,” “Music for the Marquis de LaFayette,” and “Colonial Spies”–we also love getting the chance to play music of different eras. Most recent was Victorian Christmas, which occasioned the creation of an 1870s-style gown, complete with a bustle. And once we had the clothes, well, we had to start working on non-seasonal songs to go with them. The Victorian parlor songs we’ve learned as a result have opened up a new musical world to us–rich, melodious, deeply moving. Soon to be announced, our first concert to incorporate some of these songs: “Music Through American History,” beginning with the colonial era and extending through World War I.